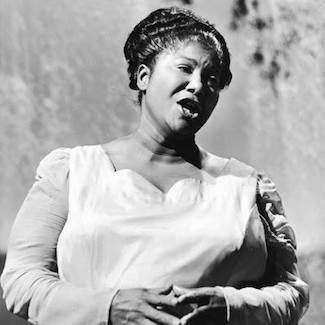 Quintessential gospel singer Mahalia Jackson, often called the "Queen of Gospel" was born on October 26, 1911 to an impoverished family in New Orleans, Louisiana. Her father, John A. Jackson, Sr., was a dockworker and barber who later became a Baptist minister. Her mother, Charity Clark, died when Mahalia was five. Jackson began her singing career at Mt. Mariah Baptist Church in New Orleans. She fondly recalled that when she joined the church she was baptized in the Mississippi River. While a child Jackson was exposed to the mélange of musical styles brimming throughout New Orleans. Though influenced by jazz and blues, she was drawn to gospel music and firmly established herself as a gospel singer. In 1927, at the age of sixteen, Jackson moved to Chicago, Illinois and joined the Salem Baptist Church Choir. She soon began tourning the city’s churches with the Johnson Gospel Singers. In 1929, Jackson met legendary composer Thomas A. Dorsey and toured with him for fourteen years. One of Dorsey’s compositions, "Take My Hand, Precious Lord," became Jackson’s signature song. Jackson made her first gospel recording in 1931. In 1947 Jackson signed with the Apollo label and one year later recorded "Move On Up a Little Higher," a song that eventually sold eight million copies becoming to that point the most successful gospel recording in history. rendition of "Silent Night" on Denmark‘s national radio generated more than twenty thousand requests for her recording. Jackson sang in two Hollywood (California) movies, St. Louis Blues (1958) and Imitation of Life (1959). In 1961 she performed at the Inaugural ball for U.S. President John F. Kennedy. Jackson had earlier pereformed at the White House for President Dwight D. Eisenhower. In 1963 she sang before her largest audience, 250,000 people at the March on Washington. She also sang at Carnegie Hall and was the first gospel singer to appear at the Newport (Rhode Island) Jazz Festival. Jackson used her commanding contralto voice to move her audiences in the United States, Europe, Africa, and Asia. She met Indira Gandhi while performing in India and performed for Liberian President William Tubman. Her powerful voice was used to support the Civil Rights Movement in the 1950s and 1960s when she sang for dozens of fundraising benefits. One of her last public performances was at the funeral of her friend, Martin Luther King, Jr., in Atlanta, Georgia, in 1968. Jackson’s awards included a Grammy and induction into both the Gospel Music Hall of Fame and the Rock and Roll Hall of Fame. Months after collapsing at her final performance in Munich, Germany, she died in Chicago on January 27, 1972 at the age of 60. Laurraine Goreau, Just Mahalia, Baby: The Mahalia Jackson Story (Waco: World Books, 1975).